Consider this: Fragments of a PLOS ONE paper overlap with pieces of other publications. The authors used them without credit and without quotation marks. This sounds an awful lot like plagiarism — using PLOS‘s own standards, even. But the journal isn’t calling it plagiarism. They’ve labeled this an instance of “text overlap,” a spokesperson told us, based on the amount of material that the paper shares with others. The last author — Carlo Croce, who has two retractions under his belt — denies that he plagiarized, and says that his university has cleared him of a plagiarism charge from an anonymous whistleblower. After the publication of the article [MiR-34a/c-Dependent PDGFR-α/β Downregulation Inhibits Tumorigenesis and Enhances TRAIL-Induced Apoptosis in Lung Cancer], it was noticed that fragments of text in this article overlap with that from previous publications. The overlap in the text relates to the Introduction, Results and Discussion sections, where sentences were reproduced without quotation marks. We would like to acknowledge this and include the relevant references. It should be noted that no concerns have been raised regarding the originality of the work reported in the article and that this has no bearing on the results and conclusions of the study. Hermeking H. The miR-34 family in cancer and apoptosis. Cell Death Differ. 2010 Feb;17(2):193–9. doi: 10.1038/cdd.2009.56. Tanaka N, Toyooka S, Soh J, Kubo T, Yamamoto H, Maki Y, et al. Frequent methylation and oncogenic role of microRNA-34b/c in small-cell lung cancer. Lung Cancer. 2012 Apr;76(1):32–8. doi: 10.1016/j.lungcan.2011.10.002. Zhang H, Bajraszewski N, Wu E, Wang H, Moseman AP, Dabora SL, Griffin JD, and Kwiatkowski DJ. PDGFRs are critical for PI3K/Akt activation and negatively regulated by mTOR. J Clin Invest. 2007 Mar;117(3):730-8.doi:10.1172/JCI28984. The 2013 paper has been cited 40 times, according to Thomson Reuters Web of Science. The journal office was alerted to instances of overlap in the text of the article with that from other publications. Upon follow up with the authors and evaluation of the level of text overlap, the editors considered that the most appropriate step was to issue a Correction to make readers aware of the instances of overlap in text with the sources listed. All members of the PDGF family display potent angiogenic activity in vivo, and from this point of view, PDGF-B/PDGFRβ axis was the most extensive evaluated. Virginia Barbour, the Chair of the Committee on Publication Ethics, told us that in general “there is no numerical value that can easily be applied” as to how much overlap constitutes plagiarism, adding that she cannot comment on specific cases. Following an [anonymous] denunciation the University investigated the matter and found that there was no plagiarism whatsoever. Keep in mind that people…reading a paper may get some sentence impressed in their mind and then repeat it in a paper. That has to be avoided, but it might happen. If the paper is completely different, possibly on a different subject, with completely different data it would be very difficult to claim plagiarism. We were unable to verify the claim that OSU cleared Croce of a plagiarism charge. The Research Integrity Officer at OSU declined to comment on whether Croce had been investigated, citing an OSU policy against disclosing that information. To shift gears a little here: this is not Croce’s first tangle with notices. He shares two retractions with Alfredo Fusco, a cancer researcher in Italy who has been under criminal investigation for scientific misconduct. And many of Croce’s papers have been flagged on PubPeer by commenters suggesting that there are issues with some of the figures. During figure preparation for the original article, the image of the western blot showing MDM2 protein expression upon miR-194,192, 215, and scrambled sequence (Scr) treatments in the MM1s cell line was mistakenly replaced in Figure 4A with the image of the western blot showing MDM2 in NCI-H929 cells in the same figure panel. The correct corresponding image of the western blot showing MDM2 protein expression in MM1s is shown below in the corrected Figure 4A. 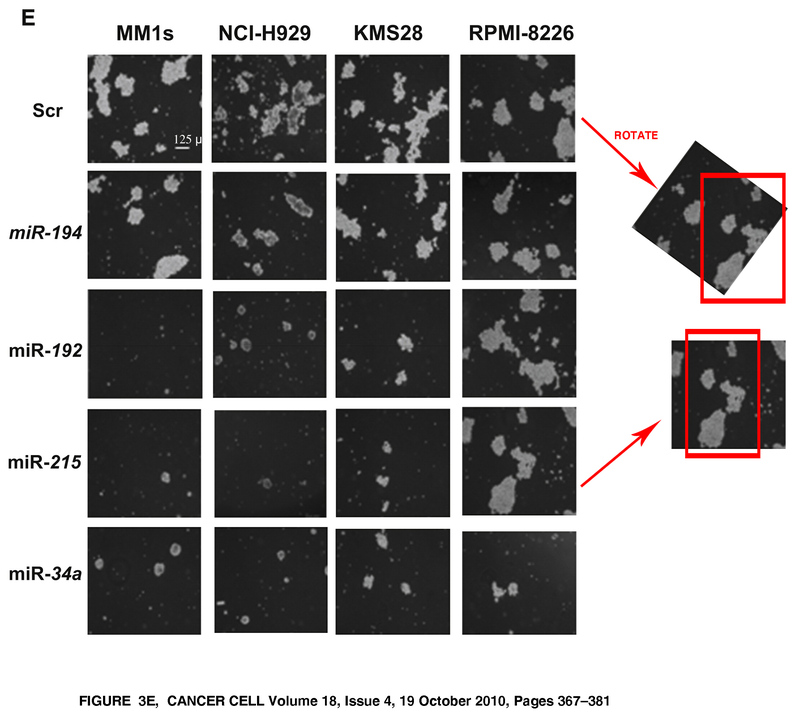 In addition, because multiple normalizations of the same set of samples were performed due to the use of phospho-antibodies, the authors inadvertently duplicated the Gadph image of MM1s in the total Akt image of NCI-H929 in the same panel. The results were not affected by this duplication. The corresponding total Akt and Gapdh images used for pAkt normalization for both RPMI-8226 and MM1s are now included in the corrected Figure 7A, shown below. The authors apologize for these errors and any confusion that they may have caused. The 2010 paper has been cited 197 times. In 2014, we reported on a letter from OSU to pseudonymous whistleblower Clare Francis saying the university and the U.S. Office of Research Integrity had chosen not to investigate a few of Croce’s papers in response to specific allegations Francis raised in 2013. The reasoning: the manuscripts were not generated at OSU, and no OSU employees had contributed to the figures in question. I’d say, if one copies even the grammar errors – I think the example should read “extensively” (or perhaps “extensively one” depending on the intent, instead of “All members of the PDGF family display potent angiogenic activity in vivo, and from this point of view, PDGF-B/PDGFRβ axis was the most extensive evaluated.” – then I would not hesitate calling it plagiarism. Cancer Cell. 2010 Oct 19;18(4):367-81. doi: 10.1016/j.ccr.2010.09.005. Downregulation of p53-inducible microRNAs 192, 194, and 215 impairs the p53/MDM2 autoregulatory loop in multiple myeloma development. Pichiorri F1, Suh SS, Rocci A, De Luca L, Taccioli C, Santhanam R, Zhou W, Benson DM Jr, Hofmainster C, Alder H, Garofalo M, Di Leva G, Volinia S, Lin HJ, Perrotti D, Kuehl M, Aqeilan RI, Palumbo A, Croce CM. 1Department of Molecular Virology, Comprehensive Cancer Center, Ohio State University, Columbus, 43210, USA. Not addressed by 2016 correction. Several related factors can make specific labs and networks susceptible to problems like plagiarism. When the first language in the lab is not the prevailing publication language (today, English). People who don’t have a chance to practice their professional language in the professional setting are more likely to be tempted by shortcuts. Lack of diversity. Related to language, why would any lab, in the US especially, be composed of senior people, postdocs and up, mostly coming from one foreign country? Internal promotion. Most US universities encourage graduates and postdocs to move to other universities, but in some large labs, there appears to be a lot of internal hiring. This makes investigators highly interdependent and indebted to the bosses and sub-bosses, even if they ultimately leave for another university, and you might get more “honorary authorships” without proper scrutiny. There’s also more tendency to circle the wagons when questions are asked. “People who don’t have a chance to practice their professional language in the professional setting are more likely to be tempted by shortcuts.” CM Croce has been in the U.S. for decades. During trip to Chicago London Mayor “We shouldn’t be embarrassed to say that immigrants should learn our way of life — for example, people employed in public-sector jobs in London should speak English.” Why shouldn’t that go for public universities in hte U.S.? The question should be, ‘When does plagiarism become overlap?”. The answer is: When the author is paying to publish. I agree. What often gets lost in this discussion is service to the reader. There are times when the author’s prior data/commentary is germane to support the present conclusions. Not all of us have easy, inexpensive access to journals with prior articles. It really helps to have the complete story in one place. There needs to be agreement between editors and authors about reasonable reuse to support the conclusions of the latest article. I find it interesting that Richard Stallman gave a seminar before a group of authors and was expecting a lot of pushback when he called for shorter copyright times and easier subsequent use. He was surprised to find most of the authors wanted shorter times for reuse as part of derivative works. We must not lose sight that copyright legislation was originally designed to be for limited periods so that authors/artists could make a living and that the audience would have broad access to the information. “Text overlap” is equivalent to plagiarism if a paper is retracted. The more pleasant term is used to reduce the likelihood of a lawsuit, though meritless, but nevertheless a nuisance that journals would rather avoid. October 2016 Carlo Croce retraction. It might be best to look at the data. How is it possible to discuss the problem when “It’s not clear exactly how much of the text appears to overlap with the other publications” ? Here’s one data set. The other comparisons are similar.